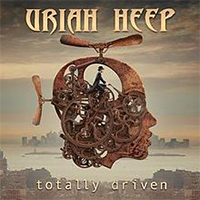 So, Uriah Heep opted on upgrading career highlights by injecting fresh blood into the classics. It may seem an odd move from the band, since the risk of tampering with past glories is obviously high, and it is all for little or no apparent gain. However, Heep show they have what it takes to make memory lane walks comfy strolls. Traditionally, Uriah Heep are fond of shoehorning an “epic” (or two) into each of their albums, you know, that sort of an ambitious widescreen anthem designed to trigger an outbreak of waving flags; that said, “Return To Fantasy” and “Look at Yourself” fit that description perfectly. On the other hand, Heep follow the original work print quite closely “Come Back to Me”, with Bernie Shaw utilizing Lawton’s warmth and thoughtfulness effectively. Although the sound is thoroughly beefed up, the scent of old school rock trickery remains prevalent throughout this 2 disc set. Takes on “Gypsy” and “Bird of Prey” for example, are controlled and artful at the same time, and have that classic rock naturalness attached to it. Speaking of tricks and gentle nudges, Mick Box’s wah-wah adds some inimitable color to “July Morning”, meanwhile there some fitting string petting on “the Easy Road”. Bernie Shaw slithers effortlessly through the set, only occasionally tweaking the tunes. His delivery has authority stamped all over. He shivers relentlessly through “Easy Living”, folds into the thick stew of “Love in Silence” and dashed madly along with “Between Two Worlds”. Curiously, Peter Goalby period and the bubblegum era of John Sloman remain ignored. In addition, one might think that John Lawton deserves much more credit with such nostalgia throwbacks. That aside, “Totally Driven” is still a treat.